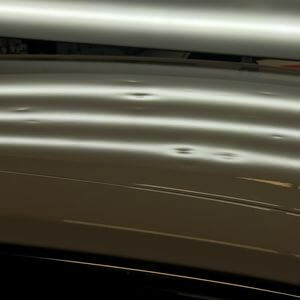 Hail Damage can be repaired using Paintless Dent Repair (PDR) methods in a similar process in which dents and dings, shopping trolleys and car doors are removed from a vehicle without damaging the paintwork. Hail Damage has many levels of severity and size. Severe damage may require traditional panel shop repairs and the vehicle may even be written off by the insurance company. Hail damage must be physically inspected to determine repairabilty and cost. We are unable to provide estimates based on photos or over the phone. Reparable Hail Dents are skilfully removed from the vehicle by massaging them out from the rear of the panel using specialised tools, or pulled out using technically advanced pulling systems. This specialised PDR process does not damage the paint, eliminating the need to panel beat, use body fillers or repaint the vehicle. Paintless Dent Repairs for Hail Damage is quicker to repair, more convenient for car owner and less expensive for Insurance Companies compared to traditional panel shop repair methods. You are not required to leave your vehicle for weeks or months. In most cases, we can repair Hail Damage within a few days. Amazing Dents N Detail is Insurance Company approved and highly skilled in repairing Hail Damage.